Though the game was a bit of a yawner compared to last year, T-Mobile customers in the ATL were using data like crazy at the Super Bowl. And they were really the ones who won big! T-Mobile clocked the fastest speeds at Mercedes Benz Stadium – on both upload and download the whole game through. 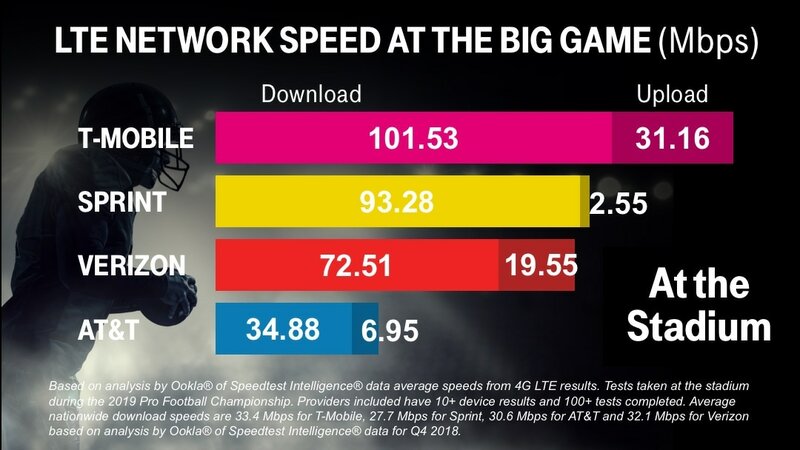 That’s four years in a row of T-Mobile being fastest at the Super Bowl - sorry Verizon and AT&T. And what did Un-carrier customers do with all that speed? They used 138% more data compared to last year’s game! I have a feeling that customers will be eating through data on Tuesday, too, sharing their taco excitement after the news we shared last night. Here’s some more insight into what all that speed delivered. See you in Miami for Super Bowl LIV!